HELP PLZ - does anyone know how to change the colour of hyperlinks on my web page? i want to change them to pink to match my site. You will need to click on the HTML widget on your text editor box. or you change change all your links with this code. This will over-ride any color. You drag an HTML widget box over from the right-hand side and paste this code inside and then place high up on your site. Please let me know if you need further help. excellent advice from Littleus here - just a note - the CSS (the bottom code) will not work in most styles - although it will provide visited / hover and active color changes it will not effect the standard default link color. It may work in your style but not in all, if your wondering why its not working, its because your style wont allow it. The best way to change the a link color is to use the first method she gives you. sorry - just another little note - what i forgot to mention was it will change any links in html widgets - it will NOT change link colours in a text widget. The first method works in all widgets, text and html. i dont know whay the CSS works on links in a html widget and not in a text widget - that is beyond me. I took your suggestion and started changing my text links individually, which open up or download a PDF. It worked well for about 15 links and then suddenly I couldn't get it to take the new colour for any future links. I logged out, rebooted and logged back in and it still will not let me change any more link colours for my site. The background is black (which I can't change) and the links are dark red (poor design) and I need more contrast with the background. Any suggestions. Thanks. The difference your seeing sounds perhaps like something to do with text widgets and html widgets - links behave differently in each of the 2 widgets. thanks so so so much i will try it now. i really appreciate your help! thanks guys that worked well!!!! is there any chance i can change the green circle with the tick in it? I'm glad that the text link worked out for you! Now regarding the "green circle with the tick in it" - I'm not certain what you mean by this. Would you mind sharing your url or posting a screenshot so that I can see what you are talking about? sites looking great - i think that is a built in image (the tick) nothing can be done to it. Unfortunately Lee is correct, this image appears to be a part of the template. What template are you using? If the tick really bothers you, you may need to find another template. Sorry Byron, wish I had better news. 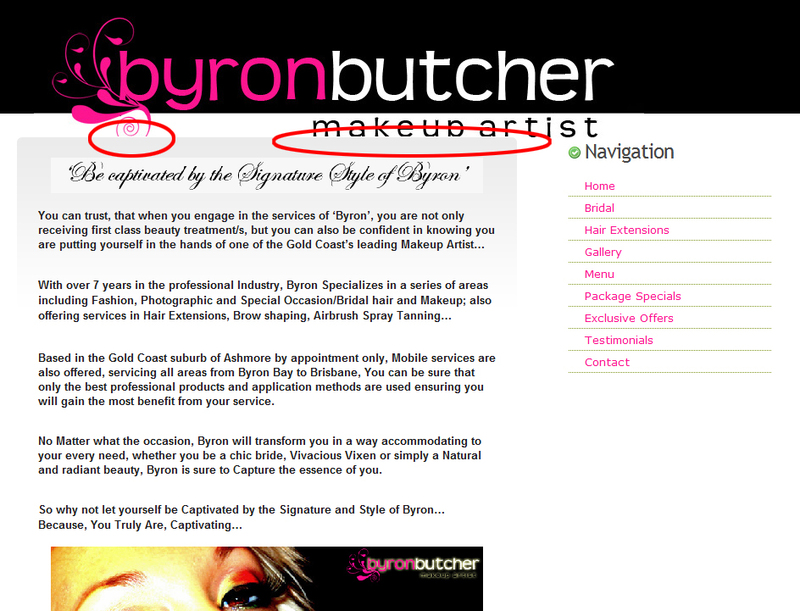 Byron.. you have done a great job in putting together your site. It looks professional, easy to navigate and understand. Just a little note here - your "menu" page does not seem to work. I don't know if that is a work in progress but I just wanted to let you know. Also, I would suggest adding a favicon to your site (a little icon that shows up in your browser window beside your site address). You can do this by going to "properties" and scrolling down until you see "favorite icon". Add your icon and then save and update your site. One other thing that you may want to consider is have an e-mail submission form right on your site. This may make it easier for your customers to contact you. I personally use www.jotform.com to create my contact form. You can customize your form and have the information sent to your email address. You will have to check whether or not Jotform is the right one for you though. Yola has Wufoo and another one (I can't remember the name though) which is integrated with them. You can find these under "content". mmm that is odd - the menu page is working - maybe i was updating it while you were looking at it? - im going to do the email submission - but do you know it there is a way that i can set up my own email for my site - like info@byronbutcher.com - is that possible? - what is the best way to display pictures? 2. I believe that if you want an email for your purchased domain, you need to send a request to support@yola.com They will be able to help you out. If these don't meet your needs, then you could explore external options and having them link to your site or using iframe or embedding them into your website. 3. Your site shows fine for me in FF but not in IE7. Unfortunately not everything translates the same in all browsers. One thing you could maybe try to do is add a text widget box (leave it blank and enter until desired width - I find that I don't need to hit enter as the box gives me enough space on its own) underneath your banner to give it a bit more space between your banner and your site content. This may make a bit more space on FF but hopefully, it'll be negligible. Domain email: The email address can be done easily. just send an email to support@yola.com stating your wish. They will set you up as you have your own domain. Displaying pictures: My preference is to use a text widget. This allows positioning a little more critically and easy WYSIWYG sizing. I generally combine this with a two column widget (It gives you greater placement flexibility). ii. Place a text widget into one or both columns. iv. Grab the red square of the image and size it appropriately. v. Move the divider of your two column widget to do some more positioning of the image. 1. Move your "be captivated....." image down a bit. 2. Retrieve your original copy of "be captivated....." and reduce the opacity of the grey background (the amount would have to be determined by trial and error). You would need access to Photoshop or some reasonably sophisticated image manipulation program. As always feel free to get back to us if it sounds unclear or if there's something else that needs to be done. Great luck with this Byron. ok so i have done the domain email. even when i didnt have the "be captivated" image there - it was still being cut off - I tried to add a extra widget under the logo but it would not allow me to do so - so i dont really know what else to do? You have your main content frame with your widgets all in it. Between the main content frame and the actual content, try inserting a text box widget in there. Does this make sense? Let me know if this worked - if not.. we'll try to think of something else! What are you using to create the form. I mean which provider. maybe I can help? Forget the last question byron. lets head over to jotform.com. Tell us when you get that far and we'll get you going? Jotform is the most elegant and quite easy to use. You can very easily customize the look and they have lots of options. Go for it lu. you have far more experience with jotform than i do. Thanks for this lu. You're in an experts hands Byron. If you go to the source heading at the top of the form you have access to the most powerful aspects of customising the form. before you do though there are some things that you can easily change on the mashup board. The font colour uses the hex code for colours so it would be good if you have a colour chart but preferably a colour match program. There's one for FireFox called Colorzilla. It's brilliant. All you have to do is move your cursor over a colour you want to select and copy the code. Paste that code into whatever application such as the font colour in Jotform. this allows you perfect matches every time with other colours on your web-page. When you get so far, Save your form. Copy option #2 of the source code. Paste it into an HTML widget. I hope that this gives you a better confidence in what it may do. it's almost limited to your imagination and skill. The skill can be shared here, so I really am confident that you can produce something equivalent to the quality of your pages. I really mean that Byron. I'm not the person to design the artistic aspect. You are. I'm sure LU will be with you all the way and I've watched your independence on tasks, you're bright and quick. You certainly shouldn't consider your needs a burden. You're targeted as voice here in a very short space of time I'm sure. Hang around! I just wanted to let you know that I'm heading to bed. If you run into any problems, please do let me know and I'll get back to you. Take care! LU has zzz'd of. I am sure that a good design with jotform won't cheapen your page at all. There are some stunning effects that you do with it. My suggestion is to do the basic layout and then Littleus can help you with a concept that you may come up with. Please email us support@yola.com and we can help you with this. thanks for that - what site did u get that mailing list from? Littleus created the form with Jotform Byron. There are many options within their style sheets. Littleus will be back on-board within a few hours. Are you OK with the email setup with Google now? I am not sure if you want me to chase anything up or whether you have got it all in hand with Ruth? I'm back again! =) I see that you've successfully created your e-mail form Byron. Way to go! Did you need further help with this or is everything to your satisfaction? p.s. Thanks Peter for helping Byron out on this. lu - i really like how you made your form - is that a bit more tech? I'm here! What would you like to try and do with your form? im still a bit confused how to do the google set up? or you can do it the easier way. At the end of your html line with the appropriate link there is what you call an "ending tag"... this tag is what determines if the link can or cannot be changed. An example ending tag where the color cannot be changed is... < /A >< /FONT >< /SPAN >< /P > ... if you change it to... whatever the case... < /FONT >< /A >< /FONT >< /SPAN >< /P >... then go back to your text widget, highlight the link, and change the color... of course, without the spaces... it shouldn't have a problem working... this is something Yola needs to change... it should be our choice what the color of the links be and this has cost me the most time-wasting than any other fault.